This is an awesome burnout fabric pink ribbon shirt. There is a crystal pink ribbon on the front. Shirt is 100% Made in the USA. 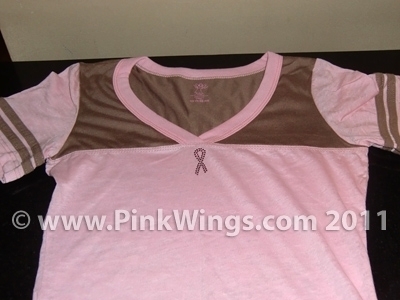 This adorable burn out fabric shirt has a crystal pink ribbon placed in the center of the shirt on the pink, below the v-neck. These shirts are available in sizes L, XL and 2XL only. Small and Med are now sold out. Exclusive to the Pink Wings website. Order yours today!